The last book I read was too easy on the characters. This one is almost too hard on them. 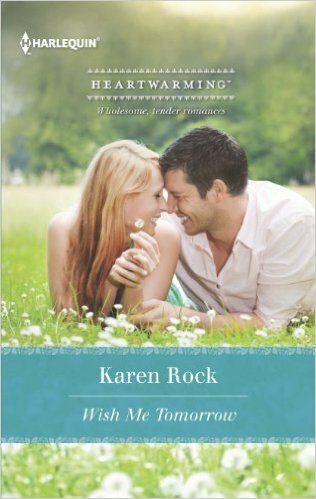 Wish Me Tomorrow, by Karen Rock, is a 2013 Harlequin Heartwarming. It has won several awards, and is now available as a free download. Christie is a nurse and a grief counsellor. One evening, a handsome man walks into her life, pushing the wheelchair of his elderly friend to her cancer survivor support group. When the friend has a stroke, Christie revives him, then fills in for Eli’s sitter while Eli accompanies him to the hospital. By the end of the night, Christie has been to Eli’s apartment, met his kids, and they’ve learned a little about each other. There is mutual attraction, and hesitation. Eli has had cancer. He is reluctant to get involved in a relationship, in case the cancer recurs. His wife, never much interested in family, left him when he got sick. He also finds the upbeat Christie unrealistic. Christie is more open to a relationship. She finds various ways for them to spend time together, such as morning runs. She becomes friends with Eli’s children, particularly his young and acting out teenage daughter. However, she’s haunted by her reaction to her brother’s death from cancer, when they were both teens. When Eli’s friend dies, the funeral is difficult for her. This book has a lot of grim reminders of mortality, repeating the lesson to enjoy life while it lasts. Although there are already obstacles to the relationship, Rock also stresses the different socioeconomic status of her lovers. Christie lives in a shared illegal apartment, and grew up poor due to the costs of her brother’s cancer. Eli has an impressive luxury apartment, has retired from his lucrative photography career to be lucratively self-employed as a graphic designer, and seems comfortable financially despite his circumstances. It’s not clear why this difference is so stressed. It does not seem to bother either of them. With so many romances set in small country towns or rural areas, it was a delight to read one in the thoroughly urban setting of the Soho neighbourhood of New York. Rock uses plenty of urban details, such as dinner in over-crowded restaurants, visits to dog parks, and travel by taxi as a way of life. The deftly handled setting, realistic characters, and strong narrative arcs add up to a well told story. I found it a little too dark to be enjoyable, but it certainly is touching and heartwarming. There is of course a happy ending, but it’s more bittersweet than usual, in keeping with the book’s theme of enjoying life while you can.